Blogging is a current trend for any generation. Anyone can start blogging – a student, a writer, a scientist, a fashion designer or a tech savvy, or a biker, or a bookworm, or a cinephilia – I guess you got it, it’s a never ending list by profession or hobby. Anyone who is devoted to something, or passionate about something can start blogging with that and for that. Why Should People Start a Blog? Blogging helps you to learn, help you to grow, help you to spread your knowledge. Besides this, you can meet new and genuine people from around the world, you can create loyal followers, you can discover yourself new way. And of course, you can earn your living hood without work for any individual person or any organization.But before learning these reasons, first of all you should know “What is a Blog / Weblog?” . 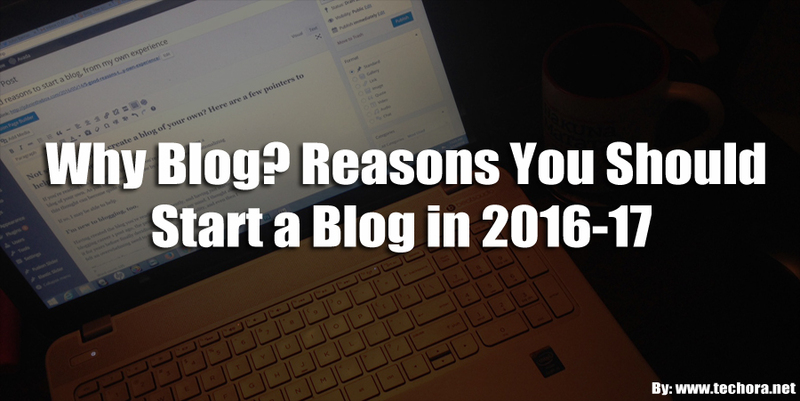 Here I listed 5 reasons to start a blog in 2016-17 for you so you can understand the endless possibilities of blogging. This is the main and enough reason for any human to start blogging. If you know something you should share with others. This is what we should know for – passing. Blogging gives you that platform to passing your knowledge. What I hate about all those so call the top and successful known in their profession is they don’t want to pass their knowledge. If they know something better, or know any secret they should teach others. You are maybe an actor, a farmer, a lawyer, an engineer, a musician or anything whatever you know better, you should teach others. Give it for free or set a price – before you die, spread your knowledge. If you want to pass your knowledge, blogging gives you the opportunity to expand your knowledge to a much larger network – all over the world. One of the main reasons for blogging is you can turn it into a business. However, when you are starting a blog for the first time, you should not start thinking that this blog would make you money. When you start your career as a blogger, money thinking not only can distract you but also can disappoint you badly. You have to understand that it doesn’t happen overnight. But, yes, you can earn your living hood with blogging and so very much that you can’t imagine. Blogging gives you an opportunity to leave your daily and boring 9 to 5 jobs. Instead, follow your love and dedicate to your passion and start writing. It gives you an opportunity to become your own boss – and a businessman. No more daily and boring schedule, no more satisfactions. Also, you can use it to make an extra income when you are still doing your day job. Working for yourself may don’t sound interesting to you. But still, you should start a blog from now. Real life marketing is changing their track into the online marketing. So, a blog in a specific field can help you to become an employee for those firms and startups who want to hire. Blogs are the the wonderful things that help bloggers to establish themselves and prove as an experts in a specific field or topic. For example, if you’re a student and want to higher study, then you can choose some particular subject and become master in this topic. Same in blogging, you can choose any particular topic and establish yourself as an expert due to a lot of research and practice in this topic and you know “Practice Makes a Man Perfect”. Blogs are best tools that provide you the opportunity to research a lot and find different things that your readers wants to read. Process of content writing encourages you think deeper and find the best solutions for any problem. You’ll delve more deeper thinking into your life matters and the worldview that shapes them. You can think more and find different new things that no one ever hear or know about them. Then, you write your findings into your own words and make an fully optimized article, and then publish on your blog and share with your readers. Blogging also gives you an opportunity to stay in touch with your family and friends, and also introduces you to new people. This two thing is not possible at the same time in other business. This is a chance for you to show your family and friends what you up to, what you are sharing, what you are doing in your life. Also, it gave a glimpse of your life to your family members who lived far away from you. Blogging is a way to tell them what we were doing with your lives at the moment. Also, blogging opens up a new door for you to meet people, both in person and online. Facebook, twitter or whatever social network you use, blogging community is one of the most active community out there. If you feel like you don’t have a true friend in the world who understand you, become a blogger and you will have genuine friends from all over the world. Because they are also a blogger and you can easily relate them in a way that no one else understands. I recommend iPage Webhosting for all new bloggers (get a Techora special discount rate of $1.99 per month on a 12-month starter plan). This guide will take you through the setup process – step by step. It is not possible to write about the endless possibility of blogging in a single post. There has more reason for you to start a blogging career right now. Its expand your skill, help you to find a new way, help you to think. Blogging can help you to write better, build your confidence, and build you credibility. It helps you build an audience and it gives you freedom.